The technical manual is now available, and registration is open, for the 2013 Canadian Cross Country Championship. The event takes place in Vancouver, British Columbia on Saturday November 30. BURNABY NOW NEWS – Burnaby sprinter Zion Corrales-Nelson took home three gold medals from the 2013 Legion Canadian youth track and field championships in Langley last weekend. The junior St. Thomas More student won both the under-16 girls’ 100 and 200 metre sprints, while also anchoring Team B.C.’s 4x100m relay team to gold in the open event at McLeod Park in Langley. Corrales-Nelson was favoured in the 100m dash and won in a time of 12.12 seconds, over runner-up Gracia Muamba of Alberta. The Burnaby Strider club runner added the 200m gold to her mantel with a race-winning time of 24.53 over silver medallist Kyra Constantine of Ontario. In the relay, New Westminster’s Nina Schultz shared the gold with Corrales-Nelson as B.C. won easily, breaking the tape at 47.69, nearly three seconds ahead of second-place Alberta. In the under-18 division, New Westminster’s Mihailo Stefanovic won both hurdle events, placing first in the 110 and 300m races. In the hurdle sprint, Stefanovic clocked a winning time of 14.49, while schoolmate and New West Spartans club runner, Bogdan Pavel, placed third two-tenths of a second behind. In the 300m, Stefanovic beat Matthew Bedard of Ottawa by more than twotenths of a second, clocking a gold-medal time of 38.31 in the race. 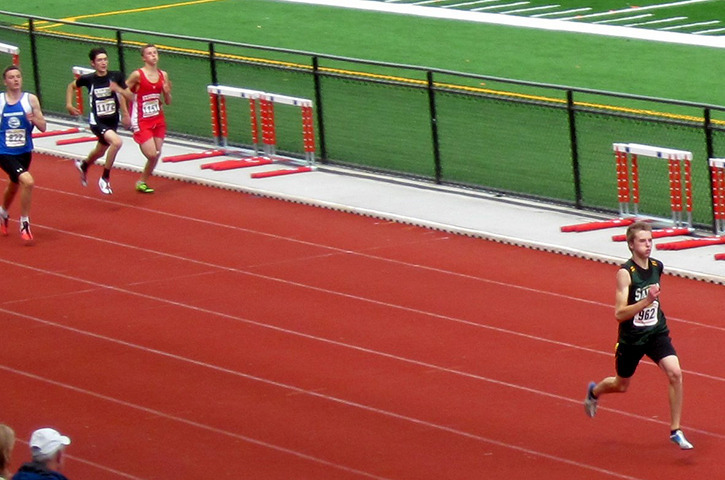 Stefanovic also teamed with Ethan Strome of New Westminster for a fifthplace finish in the 4x400m relay. Stefanovic and Strome also competed for B.C. in the 4x100m relay, but the team did not finish in the open final. Burnaby’s Ahmad Nizamani helped the Vancouver Thunderbirds club to a fifth place in the u-18 boys’ 4x100m club relay event. File Photo, Burnaby Now / Track star: Zion Corrales-Nelson of Burnaby, seen here at the B.C. high school championships, won three gold medals at the Legion national meet in Langley last weekend. COWICHAN NEWS LEADER PICTORIAL – Chicago Bains stood out among all the females during the prestigious Legion Canadian youth track and field championships in Langley while the other six valley athletes entered all attained a measure of success. Bains was honoured as the winner of the LeRoy Washburn Award as the most outstanding female athlete of the national competition and also received recognition as outstanding female B.C. Team member at the meet. “I know as I am still in a state of disbelief of what transpired, she must be overwhelmed,’’ noted coach John May of Black Creek. Bains was due back from the Lower Mainland on Tuesday afternoon. She created considerable fanfare with three gold medals that caused eruptions from a large personal and Team B.C. cheering section. Retired former teacher/principal of George Bonner School, Herb Jawanda, now living in Delta, even stopped by to see some of Chicago Bains’ magic for himself. “I applaud Chicago’s parents for making the extra effort to get her the coaching and training to give her the opportunity to bring out the best of her ability,’’ noted Jawanda. Bains won the gold medal in the U16 80-metre hurdles in 11.48 seconds, breaking the meet record of 11.60 dating back 31 years to 1982. Bains also won gold in the 200 hurdles in 27.91 and ran the opening leg for the victorious U16 4×100 relay team that included Ladysmith’s Rachel Jerome. Rounding it out for Bains was an eighth place in the 200 metres. Sprinter Taryn Smiley got into the act with two bronze medals in the U18 girls’ 4×100 and 4×400 relays. Smiley was also in the running for top placings in the individual events, finishing sixth in the 200 in 26.05 and seventh in the 100 in 12.48. Smiley had an unfortunate situation of being required to run the heats twice due to a timing malfunction. She won her heat both times anyway, but her schedule was thrown off by not having time for a lunch break. Injury restricted Tia Baker to two U18 running events. She was part of the 4×400 U18 club relay team that finished fourth and wound up 20th in the U18 400 metres in 1:00.23. Casey Heyd and Nicole Lindsay also performed well in U16 girls’ events. Heyd came fifth in the 100 metres in 12.81 and did the 4×100 on a third-place finishing team that also included the valley’s Nicole Lindsay. Lindsay was 14th in the U16 300 metres in 43.09 seconds. Ben Williams just missed a pair of medals in boys’ U16 events. He was fourth in both the high jump (1.75 metres) and the triple jump (12.84 m). Williams made Team B.C. but then was pulled due to a statistical error, but still attained strong results on a national scale under the CVAC Jaguars’ banner. Liam Lindsay claimed fourth place in the U18 boys’ triple jump with a leap of 13.25 metres and 10th in the long jump, reaching 6.09 m.
PEACE ARCH NEWS – Ocean Athletics had two new national champions among its members. At the Canadian Youth Legion Track and Field Championships – held last weekend at Langley’s McLeod Park – both Jake Hanna and Ben Ingvaldson set personal bests en route to gold-medal performances. On the second day of the three-day competition, Hanna, a 16-year-old Elgin Park Secondary student, took top spot in the youth boys 400-m, clocking a time of 48.74 seconds. It was the first time Hanna – who was one of three Ocean Athletics athletes to represent Team BC – had run the event in under 49 seconds. “That was a pretty great moment for me. It’s what I had been working so hard for all summer, to get under 49,” he said. Hanna was the second-ranked runner heading into the event – behind Ontario’s Cameron Nurse – but the South Surrey runner, knowing he’d be running against the wind, paced himself until the end, when he made a final kick. “I knew there was going to be a pretty strong headwind – there usually is in Langley – so I saved a bit for the end and made a late push,” Hanna explained. Hanna won by a few metres, with London, Ont. runner Davis Edward finishing second, in 49.27 seconds, and Nurse third, in 49.28. Ocean Athletics head coach Maureen de St. Croix was thrilled to see Hanna clock a sub-49-second run, adding that it “puts him in a pretty rare group” of runners his age. Ingvaldson, a student at Lord Tweedsmuir Secondary who, like Hanna, competed for Team BC, also had a stellar weekend in Langley, winning three medals – including one gold. Ingvaldson struck gold in the shotput, capturing a Canadian youth title with a personal-best throw of 16.15 m.
His mark beat second-place thrower Noah Rolph of Ontario by 0.55 m.
Ingvaldson also found himself on the podium in the Legion’s other two throwing events, winning bronze in both the discus – with a toss of 49.99 m – and the hammer throw, in which his best toss travelled 53.55 m.
At the club level, Ocean Athletics’ midget-aged relay teams also fared well. Ocean Athletics’ boys team – Michael Aono, Dominic Luccock, Bryan Niwinski and Dawson Ribiero – won gold in the medley relay. The club’s girls team – which included Jessica Williams, Kira Pederson, Elise Burgert and Danielle Steer – also won the medley relay. The medley relay consists of runs of different lengths – it begins with a 400-m leg, followed by back-to-back 200-m lengths before wrapping up with an 800-m portion. LANGLEY TIMES – Mission accomplished for Dean Ellenwood. Heading into the Canadian Legion track and field championships over the weekend, the 15-year-old from Langley was intent on finding the podium. And Ellenwood, who was representing the Langley Mustangs Track and Field Club, delivered, winning the 800m race and adding a silver in the 300m. Ellenwood was competing in the midget (U16) division. He won gold on Sunday, the final day of the three-day championships which were held at Langley’s McLeod Park. The championships brought together close to 1,000 track and field athletes between the ages of 12 and 17. The event will again be held at McLeod Park in 2014. In his gold-medal victory, Ellenwood crossed the finish line in 1:56.12, which was more than a full second ahead of Ezana Wossen of Centro Scuola, a track and field club out of Toronto. Taking bronze was Team Quebec’s Najib El Andaloussi. On Saturday, Ellenwood was second across the finish line in the 300m race with a time of 36.67 seconds. The gold medal went to Team Quebec’s William Gagnon while Colesen Faunt of Team Alberta/Northwest Territories took third. Overall, Ellenwood said it was really fun competing at the Legion championships and an exciting experience. “It is a big meet and all the provinces are there, which makes it great,” he said. Ellenwood, who enters Grade 10 at Langley Secondary next month, won a pair of gold medals in the 400m and 800m races this past June in the Grade 8/9 division at the B.C. high school track and field championships, which were also held at McLeod Park. Kelowna – The Okanagan Athletics Club’s middle-distance athletes have had a productive summer on the track, winning 11 provincial championship medals, including three gold. Taryn O’Neill, 13, returned from the B.C .Athletics Junior Development Championships this month in Nanaimo with a bronze in the 800m (2:29.17), a silver in the 1200m (3:50.90), and a gold in the 2000m (6:36.69). O’Neill’s winning time of 6:36.69 in the 2000m smashed the Junior Development Championship meet record by almost 20 seconds. The B.C. Athletics Championship Jubilee, held July 19 to 21 in Kamloops, marked another successful outing on the track for the OACs middle-distance group whose older athletes took home a combined total of eight medals over the course of the three-day event. Headlining the group’s showing was Sean Bergman, 15, who raced to a commanding first-place finish in the Midget Boy’s 1500m Steeplechase (4:27.31). Bergman’s winning effort in the steeplechase was followed by a clocking of 3:24.07 in the 1200m, good for third place despite losing a shoe in the early stages of the event.